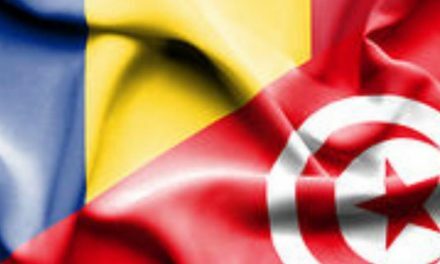 As a diplomat’s spouse my mainly role is to assist my husband in representing Romania in Lebanon and promoting our national culture and traditions, create a positive and attractive image of our home country, both in the diplomatic and local communities. Since I first arrived to Beirut, I was interested in joining the local association of diplomatic spouses (The Diplomatic Spouse’s Association of Lebanon-DSAL), as I consider this to be the easiest way to engage both locals and foreigners living in Lebanon. I had a warm welcome in DSAL and I gladly accepted a position in the committee of the organization. The Association is composed of spouses of diplomats accredited to Lebanon and its primary objective is to promote social and cultural exchanges between the different diplomatic missions present in Lebanon and our Lebanese hosts.  The organization is also involved in raising money for charity causes by organizing different events and campaigns. As part of DSAL’s regular activities, we organize on a monthly bases an event called “The Coffee Morning”, usually hosted by one of our members either in his residence or in other premises of his embassy. For the members, “The Coffee Morning” in not only a good way to socialize, but is also a great occasion to experience new cultures and traditions, since every time the host has a short presentation of his country and indulges the public with traditional foods, drinks and cultural performances. The Romanian Embassy hosted the “The Coffee Morning” in March, last year. 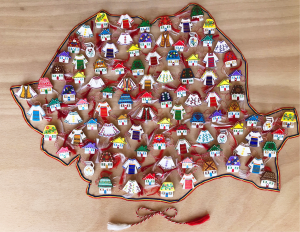 Since March is the month of the “Mărțișor”, we used the occasion to present to our guests this unique and beautiful tradition of our country. 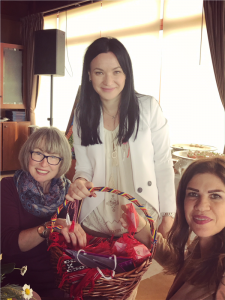 We gladly shared with our distinguished guests the meaning of the “Mărțișor”, as a symbol of the beginning of the spring. For the first time, previously to this event, I started hand crafting the small brooches we proudly wear during the first days of March. 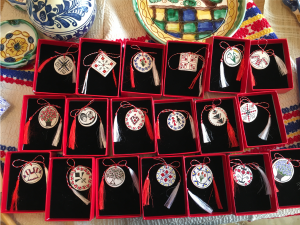 Each “Mărțișor” is hand made out of clay, manually painted with traditional Romanian symbols. To find my inspiration I studied the traditional dresses from the main regions of our country. Each of this areas has a slightly different specific, in terms of colors and graphics and I tried my best to integrate them in the small brooches. 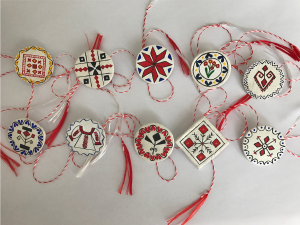 We offered a “Mărțișor” to each of our 50 lady guests and we had a great presentation in which we explained the symbolic of the white and red thread attached to it as the end of the winter and the beginning of the spring. The event was a success and everybody loved the small gifts as it triggered their curiosity to know more about our traditions and culture. I remembered the joy I had when my classmates and friends used to offer me this small gifts on the first day of March, so my two five years old sons offered the “Mărțișor” at school. 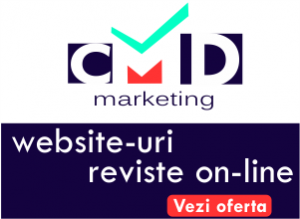 I also prepared for them a short presentation of this Romanian tradition and we received very good feedback. Their classmates were so happy to receive the “Mărțișor” and the teachers congratulate us for the initiative of sharing with them our traditions. 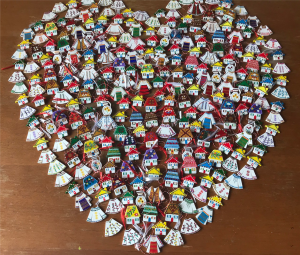 Not only has this, but parents of many of their colleagues sent us pictures and videos of their daughters joyfully wearing the precious “Mărțișor”. One of this videos, with a sweet Lebanese little girl, explaining to her mother this Romanian tradition, was uploaded one the Facebook page of the Ministry for Romanian Abroad and was seen by hundreds of people worldwide. 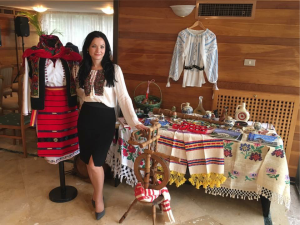 As of then I discovered my passion and talent for this kind of handcrafts, which are a great way to promote the Romanian culture. Not only this, but I also found a nice way to spend my free time. I consider myself a self-tutor since I learned everything by watching tutorial videos on the internet, reading articles on specialized web-pages and blogs and a lot of train and error experiments. 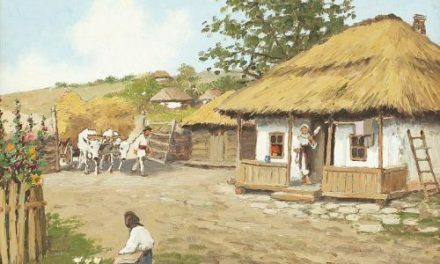 Moving on form “Mărțișor”, I started to paint on different kind of layouts and items: boxes, small pendant-style pieces, photo frames and wooden spoons. I had the opportunity to display my work at the annual “International Diplomatic Bazaar”, event that for the past four years is bringing together more than 30 countries and local artisans, which are selling a wide range of traditional foods and art crafts. Most of participant’s earning in this event is donated to charity. 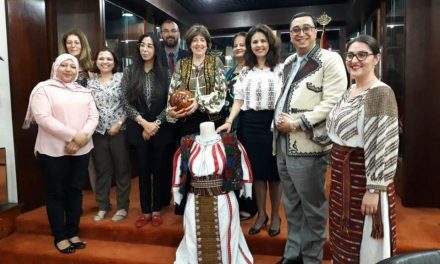 It was bought a challenge and an opportunity for me to be involved with the other spouses of the Romanian diplomats in Lebanon in organizing our national stand. It took me more than two months of work but at the end I was happy to see that more than 70% of the products we displayed were hand mane by me. For us, the event was a success since all the goods were sold which for me personally was a grate recognition and appreciation of all my hard work. Handcrafting has become my main passion and now I’m working to improve my technique and to find new ways to express myself. I’m also moving away from the period I was mainly reproducing specific models and graphics, and now I trying to put a more personal note to all my art works.